Week 19 was a lot of fun. We had some fun homeschool events, lots of playing outside, reading (always reading), and fort making. I'll let you read more below. Scrapping Tip: We had family come to visit this week, and that means I'm running a little behind on my scrapping work. In order to get this page done I had to scrap it really fast. So, I just have one tip for you this week. Just do it! Sit down for 30 minutes at your computer and scrap your page. Don't worry about playing with the shadows or adding a bunch of fancy elements. Put your photos on the template, add your paper, add a couple elements and some journaling and you are done. I'm so happy to say, that even after a super busy week, that I have Week 19 done! There will be a time to sit down, relax and scrap, but that was not this week. Journaling: We’ll start with the picture to the left. Kyla wrote a book, and Daddy read it one night to the girls. It got a lot of laughs! I love these people. To the top left you’ll see a tent the girls made in the dining room on a very rainy Saturday afternoon. At the top you’ll see the girls and Katie dancing to addition songs. To the right you’ll see pics from co-op activities. We had our first spelling bee and all the kids did great. Ashlyn got 1st place! She’d been studying very hard. We were all proud of her. Then we ran a 5K to support our local Pregnancy Care Center. We had been practicing for the last couple of months. The kids worked hard and they did great. Ashlyn beat her last 5K time by 4 minutes, and it was Kyla’s first 5K. I love my runners. Journaling: This was the first week we got the sprinkler out. The girls played for hours outside. Emmie has been reading to Lydia at night. It’s so sweet. I had to capture it! Don't forget your Daily Life Journal Card 19! Here's to hoping next week is a little more relaxing...although I really enjoyed having family here. I love seeing your weekly layouts. I like the papers you used this week! ... I also enjoyed reading your Mother's Day post. I wish I had taken photos of my kids each year with me - the only annual photos we really took were at Christmas... Thanks for this week's JC template; I really love & appreciate them! 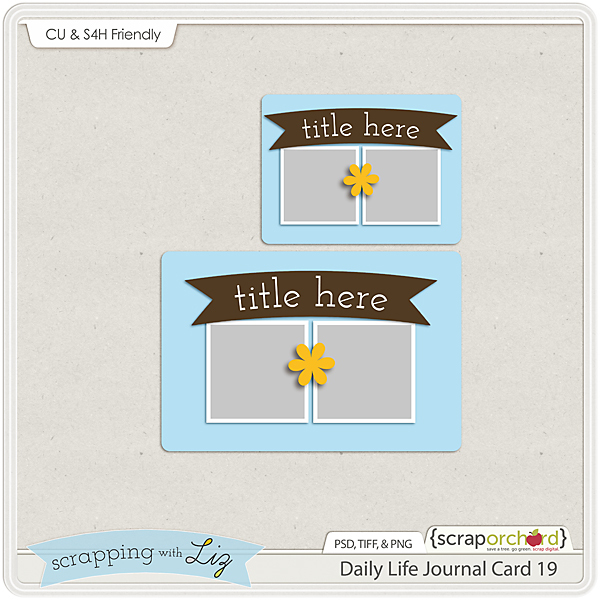 Just wanted to thank you for the free Journal Templates every week, they are fantastic! 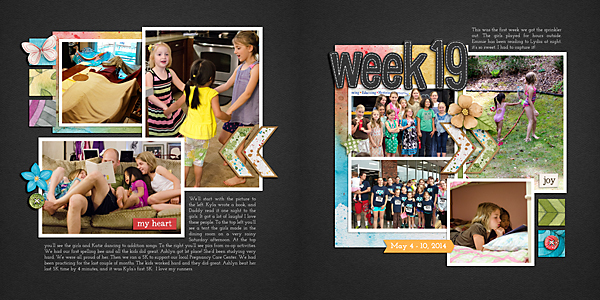 I love your weekly layouts and the wonderful journal card templates. Thank you. I got so behind this month! Thank you, again, for another great card! I love the small split squares.